"Occupy DC" encampment in Freedom Plaza. During a press conference at DoF Center on Tuesday afternoon, Secretary of Fear Malcolm P. Stag III spoke about the Occupy Wall Street protests. "Occupy Wall Street encampments have cropped up in towns and cities across the country. More than an eyesore, they broadcast a message of disunity at a time when Americans should be coming together in preparation for war with Iran or Pakistan," said the Secretary in his prepared statement. 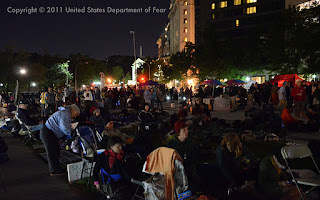 After noting that "we're not talking about a legitimate popular movement like the Tea Party," a Fox News reporter asked how much longer the U.S. Department of Fear planned to tolerate the Occupy encampments. SecFear replied, "President Herbert Hoover taught us several important things -- not just about the need to cut spending when the economy stalls. In 1932 Hoover sent in the army to burn down a tent city in Washington D.C.. Hoover showed us the way to deal with tent protests is to set them on fire." The Secretary of Fear, holding a remote control, pushed a button and a giant multimedia screen descended from the ceiling of the DoF Center auditorium. SecFear said, "This documentary ought to give you an idea what we have in mind for Occupy Wall Street." A reporter for MSNBC asked SecFear whether, under the terms of the Posse Comitatus Act, it would be legal for the U.S. Dept. of Fear to send in the U.S. Army. SecFear replied: "It's probably a job for Northcom. Under the terms of that arrangement we have twenty thousand Canadians at our disposal. Governor Harper [Stephen Harper, Prime Minister of Canada] pretty much does whatever I tell him to do. Of course, if all else fails, we have drones." At the close of the press conference, SecFear affirmed that he had confidence that President Obama would do the right thing. "First, in the interest of bipartisanship, the President has substantially embraced Herbert Hoover's economic prescription. Second, I believe this President, having received the most campaign contributions from Wall Street of any politician in history, will naturally feel inclined to follow Hoover's example with respect to the present generation of malcontents."